Website E-Invest.Biz paying RCB 50% and more, depending of the project. RCB is paid only on projects where a Referral program is based of the Deposit referral, not from profit, and that you are my referral. In exceptional cases, the website may provide minimal RCB, where the referral fee is calculated from income. RCB is not paid through other EPS! On the blog realized RCB from 1st level and from 2nd level. The time of the contribution is relative. Not terrible if you make a mistake in 3-4 hours. Write the time in GMT. Specify the Account where to pay RCB. You can pre-enter it in the profile. Press "Calculate RCB" - make sure that the amount of RCB satisfies you, there is no error in the calculations. The form will close and you will receive a personal message, a message indicating that the request for RCB adopted. After processing the application by the operator, you will be in a PM notification. Exactly the same as in the instructions above, find the order button of RCB, click the form, choose "RCB level 2". Then enter your data – login and email. 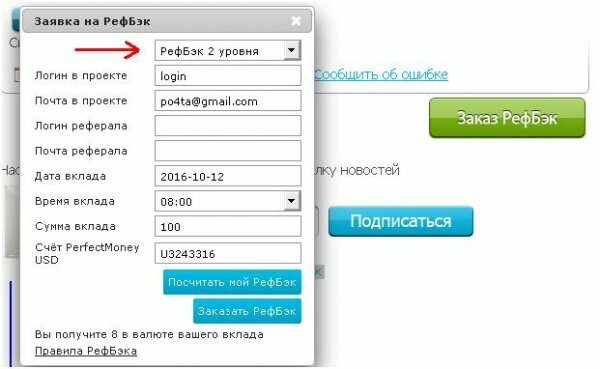 Below the username and email of your referral in the project. Indicate the date when your referral made a Deposit, the approximate time of the contribution and the amount invested by your referral. Click "Calculate RCB" - make sure that the amount of RCB 2nd level is correct, and click: "order RCB"
he form will close and you will receive a personal message, a message indicating that the request for RCB adopted. That is, for example, you are a blogger, monitor, and in one day you have 10-20 people who invest in project . Order the RCB for each referral it will be tiring both for you and for us. 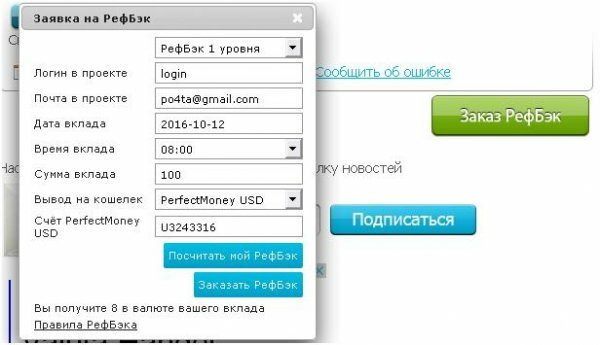 In such cases you should contact the operator or the administrator of the blog, provide a list of referrals, their Deposit and order the RCB one time, of total deposits. The operator or administrator, will collate a list and make the payment of RCB2nd level from all deposits for the day. Payment of RCBis made by the operator on a daily basis. The regulations allowed a delay of up to 2 working days. If after that time you have not received RCB, please inform the administrator. If he has free time, work and on the weekends. Order RCB is possible only within 2 days from the date of registration of your contribution! Orders RCB on deposits older than 2 days will be rejected! Order RCB in the day of contribution! New RCB for one project, can only be ordered when the operator will process your last request. f you are grateful for RCB, you can write in section of this project, which received RCB. Unique worldwide system that allows you to obtain additional compensation without private investment. If you have a referral on the website E-Invest.Biz, you can get 10% of the amount of RCB that he will order. And you can order the amount of the payment by going to your profile. If you grateful for the Referral RCB, you can write about getting right here below in the comments.